A WHITE LED in a PR-2 Base with integrated inverter for low voltage operation. Discover the advantages of WHITE led light by converting your flashlight to a WHITE led flashlight simply by replacing the bulb! 4 times or more battery life! 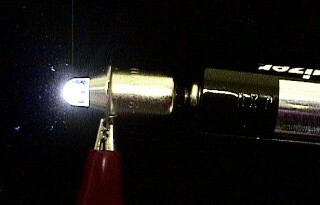 Makes usable light even when batteries are considered "dead" for a filament style bulb. Never change the bulb again - up to 5,000 hours of continuous operation compared to only 10 or 20 hours from filament bulbs! Smoother lighting pattern - fewer rings and hot spots. An even brilliant white color that never yellows as batteries drain. 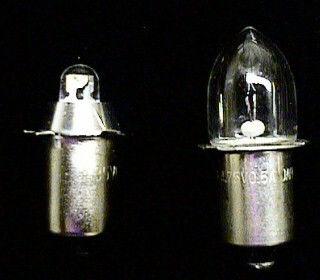 Superior shock and abuse resistance - solidstate light is much more durable than filament style bulbs. 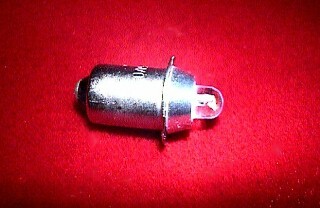 The VersaLux-PR2 is a special LED housed in a standard PR-2 base (used in many flashlights and portable lighting) for the purpose of replacing an existing standard PR-2 indandescent type bulb. Designed specifically for use in two cell alkaline battery systems (like most flashlights) - suitable for replacement in flashlights which use two batteries and a PR-2 type bulb like Maglite, Coleman and many others. 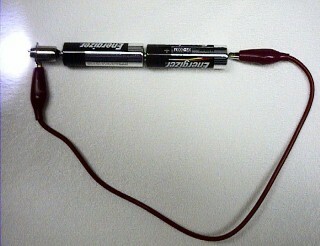 The VersaLux-PR2 consumes only 160ma or less at 3 volts. Integrated inverter allows for continued operation down to .7 volts. Technology Associates, Inc. (TAI) warrants that all VersaLux PR2 products shall be free from defects in material and workmanship under normal use for a period of 30 days from date of shipment. Products covered by this warranty shall be returned to TAI within the warranty period and upon examination TAI determines to its satisfaction that such product is defective in material or workmanship and such defect was not caused by accident, misuse, improper installation, improper adjustment, improper repair or improper testing, TAI shall at its option, repair or replace the product. Shipping charge is at buyer's expense. TAI shall have a reasonable time to make such repairs or replace such equipment. TAI's general turnaround for warranty repairs is 1-2 weeks. Buyer must include all documentation relating to the shipment, purchase and nature of the failure. The Buyer is responsible for packaging the returned material in an appropriate container in order to protect against shipping damages. TAI does not warrant merchantability for any purpose, and shall not be liable for consequential damages of any kind, however incurred. This limited warranty applies only to the original purchaser of the product, and is not transferable. Refund: If VersaLux PR2 products shall be returned to TAI for refund and upon examination TAI determines to its satisfaction that the product being returned has not been used or altered, TAI may refund full purchase price, less shipping cost, within 30 days from the date of purchase. Sorry, no refund after 30 days. Note: the least expensive shipping option for this item is USPS Air Mail.